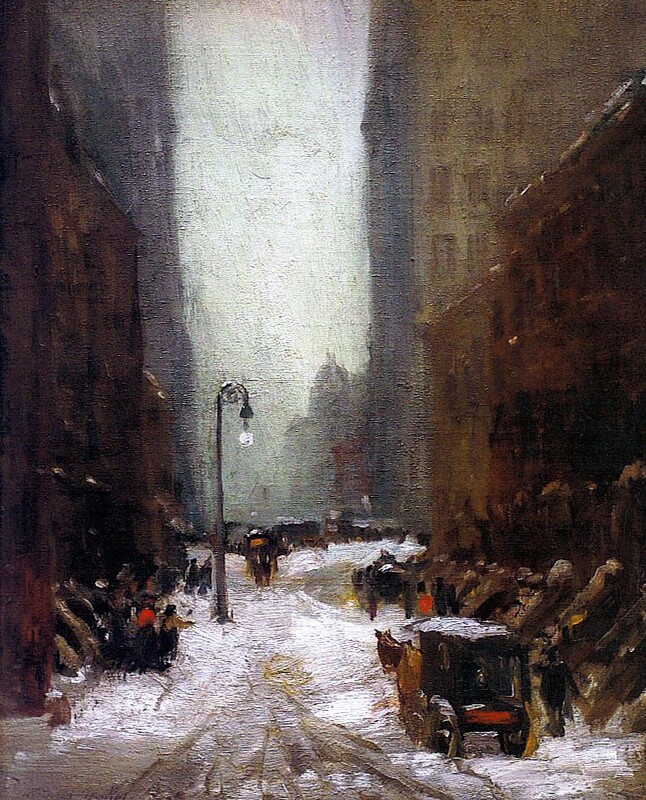 Robert Henri, "Snow in New York" (1902), National Gallery of Art, Washington, D.C.
Michelangelo hated Raphael’s guts. Van Gogh severed his relationship with Paul Gauguin, along with part of his own ear. I mention these examples to illustrate the point that not all artists who are categorized together actually got along. Even though we are encouraged to think of them collectively, the High Renaissance artists didn’t necessarily meet after work for wine spritzers. The Post-Impressionists weren’t into group hugs. There were some who were friendly to each other, of course, and some even selected the fraternal name for themselves, as if they were a service club or a motorcycle gang. The self-named Pre-Raphaelite Brotherhood, a group of 19th century painters and poets, were pretty good pals and shared common artistic goals. Their work, by the way, was as affected as the title they bestowed on themselves; as far as I’m concerned, the PRB seemed to think that “art” was short for “artificial”. In most cases, the designations applied to artists were imposed by critics or historians. The intention is to help us see the similarities of themes and techniques that artists used, so nearly everyone gets stuffed into some category. You have your Baroque painters, your Cubists, your Barbizon School, your Fauves (“Wild Beasts”), your Mannerists, and so on. In the early part of the 20th century, several American painters whose work had appeared at the same exhibition got a verbal slap from a critic: He dubbed them “The Ashcan School”. It’s sort of a cool name, don’t you think? There are a couple of reasons why that insult was hurled at them. One had to do with their subject matter, which was definitely not pastoral scenes or pretty tableaux from mythology. They painted gritty scenes of poor neighborhoods, mostly in New York City; they depicted life in tenements and slums. Another critic sputtered that their colors appeared to be scraped from the bottom of an ashcan. It’s true that most of the Ashcan artists painted with a dark palette, but considering the subject matter, delicate pastels wouldn’t have been a good choice. So who were these guys? They only exhibited together once (in 1908), and referred to themselves then as The Eight; most of them are unfamiliar names now. The most influential member of the Ashcan School — although not necessarily the most talented — was Robert Henri. He had been born Robert Cozad, but when he was young his father was involved in a homicide, so it seemed prudent to change his name. Robert selected Henri as his new surname. Instead of the French pronunciation, though, he insisted on pronouncing it with a long I: Hen-rye. His colleagues in the Ashcan School included William Glackens, George Luks, Everett Shinn, John French Sloan, and perhaps the best known member of the group, George Bellows. Henri urged his students to “forget about art, and paint what interests you in life.” That approach generated some highly original work, which inevitably scandalized the art establishment of the time. I think Henri’s dictum is probably good advice for writers, too, which is why this blog goes spinning off in a lot of different directions. I’m just writing about what interests me in life… and I’m grateful that you have come along with me. Where shall we go next? This entry was posted in Art and tagged Ashcan School. Bookmark the permalink. In the months leading up to my workshop, I spent time re-reading The Art Spirit by Robert Henri. I have long wondered the correct pronunciation of his last name – being one familiar with others mispronouncing my name, I always try to say names correctly. So – I went to the web and discovered this fine post by Tom Reeder, which gives a nice mini-history of the Ashcan School and the surprising correct pronunciation of “Henri”. Enjoy!